Sunday late morning after church, I headed down to the U of I Nature Center's birdblind. Not sure what to expect after the 10" snowfall we received at our place on Lake Macbride just west of Solon. My last visit to the nature center I got stuck and was unable to get up one of the last hills, see my blog "An example of the kindness of fellow Iowans". The roads were plowed and when I arrived at the birdblind there were several other birders present. I set up my camera equipment quickly and as quietly as possible as there were several elusive Blue Jays. I have been a regular patron at this birdblind for over 35 years, and this was the first time I saw a "party" of Blue Jays. Usually, you see none, or maybe one, if you are lucky. They were flying around, occasionally landing on a pile of snow that covered an leftover Christmas evergreen. The feeder above the evergreen was filled with peanuts. Apparently, throughout the day, a bunch of peanuts had escaped from the feeder and fallen on the evergreen. The jays came in, landed, ate one and placed one or two of the peanuts in their beaks to take to their nest (see first image below). I observed at least four pairs of jays while photographing on Sunday. 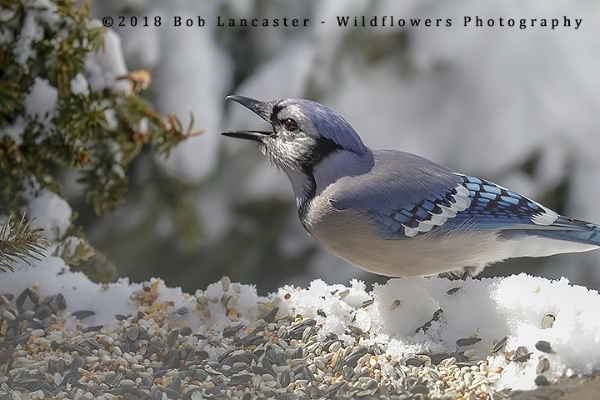 The second and third image below are some other images of different Blue Jays that finally got comfortable enough to come into the blind area and land long enough to get off several images. The third image has a excellent example of a Blue Jays' brown eyes. Jays show lots of variation in a range of traits in both the Americas and in Europe. One of them includes eye color which generally gets darker the further east you go. 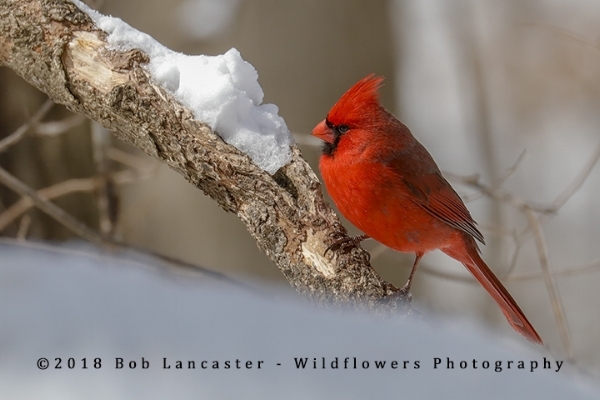 I have always enjoyed images of Cardinals and snow (see image four below) and Sunday was no exception. At one time there were at least twenty cardinals (males and females) feeding in the area. The fifth image is different. It was taken with a flash from my camera and a flash from the photographer on my left, at exactly the same time, of the same Cardinal. Both his and my image on our screens were blown out, becoming, by accident, an example of a high-key image. What I liked was the interesting color variation on the breast of the cardinal.